Terry Crowley remembers the precise moment he realized Trey Mancini was going to be special. At the end of the 2014 season, the Orioles' minor league hitting instructor handed Mancini and other members of the Class-A Frederick Keys a video he created of a batting cage session featuring big leaguers Adam Jones and Luke Scott. "When the players come back for the next season, we're in the cage, and I'm flipping them the balls, like I showed them on the video," Crowley said. "And Trey is just bam, bam, bam. He's hitting outside pitches, inside pitches. The pitches that I purposely throw bad; he doesn't swing at. "I stopped the session and I say, 'Trey, that's the best workout that I've had with anybody in a long, long time. What's the deal?' He said, 'Crow, I paid attention to the video, and that's what I practiced over the winter.'" The exercise showed Crowley, a former Orioles outfielder, that Mancini was not only blessed with raw talent, he was a student of the game and would do whatever it takes to improve. "I saw this guy in the cage and he has everything I look for in a young hitter," said Crowley, who played on the Orioles' World Series-winning team in 1970. "He's got God-given power and God-given bat speed." Crowley immediately called Orioles manager Buck Showalter and simply said: "We've got a special one." Last year, Mancini outperformed even his most optimistic supporters, hitting .293 with 24 home runs and 78 RBIs while finishing third in balloting for Rookie of the Year honors. He was the first Oriole since Daniel Cabrera in 2004 to place in the top three for the coveted honor. The affable, soft-spoken Mancini, undrafted following high school and an unheralded eighth-round pick out of Notre Dame in 2013, was thrilled just to be in the majors. "I always knew I had the potential, but going into the season, I didn't really have set goals," Mancini told PressBox in a recent interview at Camden Yards. "I just wanted to make the team out of spring training. That was my goal. So once I did that, I just wanted to stay on the team." Mancini will be 26 on Opening Day this year, but in many ways, he remains a wide-eyed kid who cannot believe he's playing against some of his childhood idols, like New York Yankees left-hander CC Sabathia or San Francisco Giants third baseman Evan Longoria. "Playing baseball is what we've all wanted to do since we were little kids," he said with a grin. "Every time we played in a new stadium, it would hit me all over again. What a really cool experience. It kind of kept it fresh throughout the whole year. I was pinching myself every day." Although Mancini grew up in Winter Haven, Fla., he has strong ties to Maryland. His mother, Beth, was born and raised in Bowie, Md., in Prince George's County and would often take her son to Orioles games. Mancini also attended games for the Double-A Bowie Baysox. "I'd visit Maryland every summer," Mancini said. "We would joke at the time that it would be really cool to play in Bowie. But what were the odds? There are 30 teams in the league, so there's a one-in-30 chance that you'd get drafted by the Orioles. And then you have to make it to Bowie." None of the big-time Florida schools offered Mancini a scholarship coming out of high school, so he decided to attend Notre Dame and major in political science -- just in case baseball didn't work out. "I knew I needed to go to college to get better as a player," Mancini said. "As soon as I visited Notre Dame, it was game-over for me. I always thought it was a possibility I could play in the majors, but I always wanted a Plan B. I know how baseball is; your career can end in one day. "You have to have a backup plan, and Notre Dame has such a good combination of athletics, academics and social life, it was the best fit for me. Sure, it's not your baseball powerhouse, but we had some good talent when I was there." One of Mancini's teammates in South Bend, Ind., was Pat Connaughton, who ultimately gave up baseball in favor of basketball and is now a member of the NBA's Portland Trail Blazers. Connaughton is "not at all" shocked that Mancini is one of MLB's emerging stars. Connaughton said Mancini's stock dropped after he hurt his shoulder prior to his junior season and that might have discouraged big league scouts. "Trey was always a performer," Connaughton said. "It's no surprise now that Trey is getting a chance. He's showing what he can do. He's always been one of the hardest workers and least talkative guys on the field. "That doesn't mean that he's not a leader. He just gets in, gets his work done and you'll never hear him complain. You might hear him yell if he miss-hits a ball that he feels he should have crushed. But other than that, he's going to work as hard as he can and be humble and grateful for everything that comes his way." Mancini received no shortcuts to the majors. He played in short-season Class-A Aberdeen and Single-A Delmarva before getting the chance to play for his mother's hometown club, the Baysox. Following a stint at Triple-A Norfolk, Mancini made it to the Orioles in 2016, and although he had just 14 at-bats as a late-season call-up, he made the most of his five-game stint in the majors. He hit .357, but it was his big league debut that ignited the buzz in Baltimore. In his second career major league at-bat, Mancini lined a shot deep into the stands in left-center for his first career homer. The Camden Yards crazies cheered wildly for the Orioles' newest hitting sensation. "On a personal level, I don't know if anything will trump that, as far as the joy I felt in that moment," Mancini said, leaning back in his chair while gazing at the ceiling, obviously re-living the moment. "Playing your whole life and hitting a home run in your first major league game was something I will never forget." Mancini had gotten jammed in his first at-bat that night and flew out. Boston Red Sox left-hander Eduardo Rodriguez tossed a pair of changeups to open Mancini's next trip to the plate, both off the plate outside. "I was thinking to myself, 'He's going to try to throw an inside fastball right here,' and I kind of sold out on it," Mancini said. "Luckily, I guessed right. And luckily, hit it well. The rest was a blur. I almost blacked out running the bases. I just remember being in the dugout afterward being embraced by my teammates. It was an incredible moment, for sure." His mother Beth was in the stands, and she became an MLB highlight of sorts with video cameras capturing her once-in-a-lifetime celebration. An inning later, an usher handed her the home run ball while the fans roared. "Just sitting in that stadium was breathtaking, and then to have that happen, it was just incredible. That was 24 years of emotion coming out." If making the big leagues isn't hard enough, having to change positions during your first full major league season would overwhelm many players. But last season Mancini easily made the switch from first base -- where Chris Davis was the immovable incumbent -- to the outfield. Mancini showed little evidence that he was shifting to the outfield for the first time since he was 10 years old. "For a first-year guy, he handled left field like a professional," said Orioles first base coach Wayne Kirby, who played eight seasons in the majors. "His mentality was to play in the big leagues. We thought if he could get 500 at-bats, he's going to be great for us. And to Trey's credit, he was open to trying the outfield. If there's a will, there's a way." Kirby said Mancini is getting better at reading the ball coming off the bat and tracking it in flight. "I played the outfield my whole life. It was second nature," Kirby said. "This is Trey's second year, and he should have more fun at it. And his decision-making will be 100 percent better." 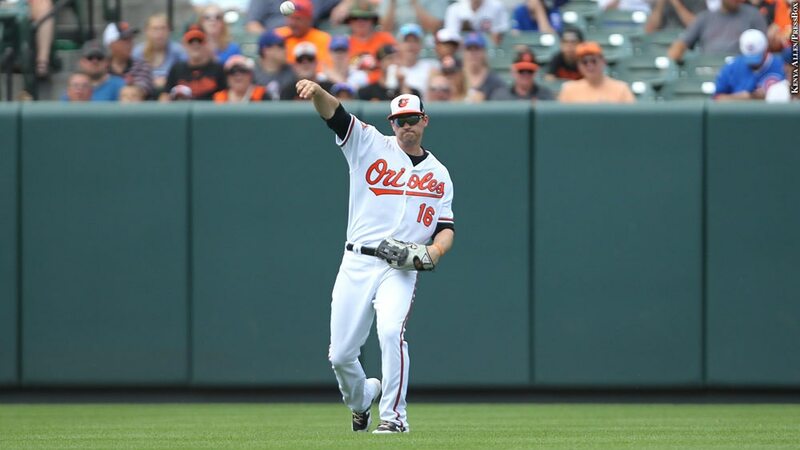 Mancini played 90 games in the outfield, and when Davis got hurt in mid-June, 2017, Mancini moved back to first base, giving the Orioles some much-needed flexibility. Orioles executive vice president of baseball operations Dan Duquette concedes Mancini was not "a prospect darling," according to several publications, but Duquette insists the stellar numbers in 2017 were no fluke. "A lot of people were surprised by the breakout year Trey had," Duquette said. "He put up some offensive numbers that had him in the same neighborhood as Cal Ripken in his rookie year. But it didn't surprise me that he did so well because he has such a consistent approach. "He’s so passionate and determined about being a good player." Being compared in any way to Ripken, a first-ballot Hall of Famer for the Orioles, can be daunting. But Duquette is certain Mancini is supremely self-assured and will not succumb to the so-called sophomore slump, where pitchers learn to better exploit the weaknesses of a hitter in his second season. "Teams will focus on any hitter that had a good first year," Duquette said. "I'm confident that Trey has all the traits and skills to make adjustments and do well. I expect him to continue what he's doing." Mancini said the notion of a second-year slide "is a story that can generate pre-season buzz" but he's not worried about it. "I don't really buy into anything like that," he said, "I'm just going to try to do exactly what I did last year. And I hope it works out." Showalter said the veteran players respect how Mancini carries himself. "They think he's very humble," he said. "He's obviously been brought up well. He knows how hard this is to do and how the game can humble you. His teammates have gotten on page with him because they like the way he carries and handles the success he's had in a short period." The 6-foot-4 Mancini, who grew up as a Tampa Bay Rays fan, knows the game can be humbling, so he tries to keep his focus and maintain the same demeanor throughout the season. "You want to work hard; you want to be in a routine," Mancini said. "You want to do what you've always done. You can't get complacent. Baseball is the last game where you can become complacent. This game will tear you down in a second if you think you're on top of the world. "And it's happened to me so many times. Things are going well, and then all of a sudden you go in an 0-for-5 slump. You can never, ever get too high in this game." Mancini admits he can get jittery at the plate, saying, “It takes a while to learn how to use your nervous energy in a good way." "You can use it just to focus better," he said. "You have to tune out the crowd noise. You have to tune out everything else but you and the pitcher. That's all that really matters -- seeing the ball come out of the pitcher's hand and reacting to it." Mancini's 159 hits in 2017 were the second-most all-time among Orioles first-year players, trailing only Hall of Famer Eddie Murray's 173 in 1977. His 17-game hitting streak is the most ever by an Orioles rookie. The Orioles will need Mancini to continue to improve if they want to challenge the Yankees, Red Sox and Toronto Blue Jays in the AL East. Crowley said pitchers gained a lot of knowledge about Mancini in 2017. But, he adds, Mancini will use his ability to hit to all fields to make the needed adjustments. It's all a chess match, said Crowley. "It's a thinking process," he said. "I know the swing is there. The strength is there. The talent is there. And, to take a quote from Buck, the 'want-to' is there. It's just a matter of putting it all together. No doubt, he can do it." Kirby, whose batting average improved 24 points during his second full season in the majors, said he'd be stunned if Mancini's numbers declined this year. "Usually when people get in jams like that, it's because they went home in the offseason and changed their swing -- they want to hit like somebody else," he said. "Trey's not that kind of guy. He's going to use the same M.O. -- hit the same way, work out the same way, and not change anything. "Look, Trey had an awesome rookie season. He faced all different types of pitchers. They know what he could hit and what he couldn't hit. And he made all the adjustments he needed to make. That's the sign of a big league hitter. He understands what he needs to do." Mancini, the 249th player selected in the 2013 draft, believes he can improve on last year's numbers. Although he's not a superstitious person, Mancini admits to having one irrational custom. "Right before game time, I go in the cage and take seven swings,” he said. "That's it. Seven swings." "Well," he admitted, holding his fists on top of each other, like he's holding a bat, "if the seventh one is bad, I'll take an eighth. Or a ninth. With the game coming up, I need the last one to be a good swing."